Human changes to the landscape, such as large areas of monoculture grassland for livestock grazing, and coniferous forests for timber production, is affecting the diversity of the 'microbiome' associated with honeybees' long-term food supply. 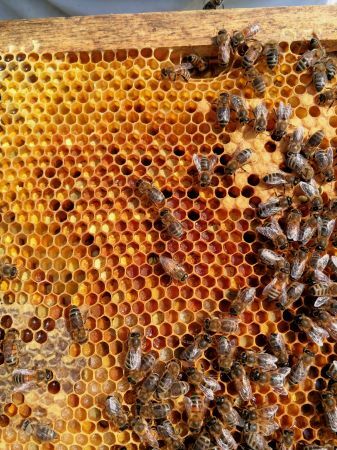 Scientists at Lancaster University's Lancaster Environment Centre and the Centre for Ecology and Hydrology (CEH) examined the mix of bacteria, known as a microbiome, of bee bread (pollen) - which is the long-term food supply stored within a hive for young bees. The researchers also discovered that some of the bacteria present within bee bread, such as bifidobacterium and lactobacilli, are the same 'good bacteria' as found in some brands of bioactive yoghurts. Bees pick up different strains of bacteria from plants when they are foraging for food and this is transferred to bee bread within the hive. Lancaster's Dr. Philip Donkersley, lead author of the study, which is published in the open access journal Ecology and Evolution, said: "We are showing that even in a small geographical area there is a huge variance in bee bread microbiome. This is almost certainly because bee bread has a variable composition made up of pollen from different plants. "It is traditionally thought that monocultures, such as grazing land and timber forests, were bad for pollinators due to a lack of food continuance through the year. However, our study suggests land use change may also be having an indirect detrimental effect on the microbiota of bee bread. "Since nutrition derived from bee bread and the microbiome therein directly affects the health of bees we therefore believe this demonstrates an indirect link between landscape composition and bee fitness." In addition, hives located near urban landscapes also demonstrated lower diversity in the microbiome of bee bread. Gardeners trying to help bees by growing a range of pollinator-friendly flowers from around the world may need to consider that non-native species may not be as good for bees as native UK plants. Native bees, their forage plants and the bacteria located within have evolved together and the bacteria bees pick up from non-native plants may be less likely to be beneficial to the hive. Dr. Donkersley said: "Decreased bacterial diversity in bee breads near urban environments suggests that the increased range of non-native plants in gardens could be impacting bees' ability to get diverse microbiota. "This may be evidence that bees suffer from foraging on non-native plants that they have not co-evolved with." The researchers used a combination of two technologies—Illumina MiSeq DNA sequencing and denaturing gradient gel electrophoresis—to identify the microbial communities of nearly 500 bee bread samples taken from 29 honeybee hives across North West England.